Has your dog or cat ever been examined for gastrointestinal symptoms? Then you probably know that one of the first questions we ask is whether your pet might have eaten something inappropriate. For whatever reason(s), pets will eat things they are not supposed to eat, and then they can end up with a foreign body in the gastrointestinal tract. Dr. Burnett: Just a variety of junk! Dr. Noureddine: A dog chewed up a tube of Gorilla glue and swallowed the glue – the glue then expanded to the shape of the stomach and hardened. Some foreign bodies will pass through the entire gastrointestinal tract without causing symptoms or harm to the animal. It can be difficult to know whether something will pass or not, with factors such as type of item, item size, and size of the animal playing a role. Many times though, the animal begins to display symptoms such as anorexia, vomiting, and/or diarrhea as the item sits in the gastrointestinal tract. Owners may or may not realize their pet has ingested an inappropriate item. Sometimes the pet is caught in the act, or evidence is found in the house that indicates the pet tore up or ate something they shouldn’t have. Owners will occasionally be surprised with an item as it passes out in the animal’s stool! However, many pets develop symptoms without anyone realizing the animal ate something. 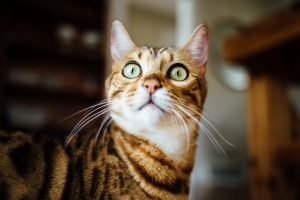 If you ever find yourself in the situation where you either know your pet ate an item, or your pet is displaying gastrointestinal signs, you should have your pet examined. 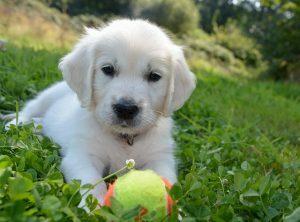 While puppies are probably the worst culprits for eating foreign bodies, it can happen with animals of any age. Symptoms can range in severity from mild to severe, depending on the item and length of time it has been inside the animal. At the veterinary clinic, our doctors will first examine your pet to assess the pet’s health status and the severity of signs. Additional testing is often performed, including radiographs, abdominal ultrasound, and labwork. We can also use Barium, a contrast agent, to help changes show up better on x-rays. A huge concern regarding foreign bodies is that they can obstruct the gastrointestinal tract. This can ultimately lead to the gastrointestinal tract rupturing, which is a severe, life-threatening situation. It’s not just bulky items that are concerning. Linear foreign bodies (e.g., strings) can also get stuck in the intestinal tract. As the intestinal peristalsis works to move ingesta along, the linear item can just stay there, often because part of the string has become stuck higher up in the gastrointestinal tract (e.g., around the base of the tongue, in the stomach). Over time, the linear foreign body will irritate the intestinal walls, and it may even cause intestinal perforations. Many animals who have ingested foreign items will have to be taken to surgery to have the item(s) removed. Performing surgery sooner rather than later can help minimize the impact the item may have if it were to stay in the animal’s system. Additionally, surgery is often life-saving! Of course, it’s best to prevent pets from ingesting foreign items in the first place. Always keep your house pet-safe, and only give your pets toys that they cannot rip up and eat. For pets who are still not trustworthy unsupervised (e.g. puppies! ), it’s safest to keep them in the crate when you are not around. Cats are notorious for eating strings and ribbons (which can lead to a linear foreign body), so don’t leave sewing supplies and gift wrapping ribbons where your cat can find them. Finally, don’t forget that items intended for pets to ingest can also turn into intestinal obstructions. For example, rawhide chews or other dental chews can cause obstructions if they are swallowed in big pieces instead of being chewed up.